IKEA UK is promoting its range of role play toys and furniture for children in “Playing with my friends”, an integrated advertising campaign. 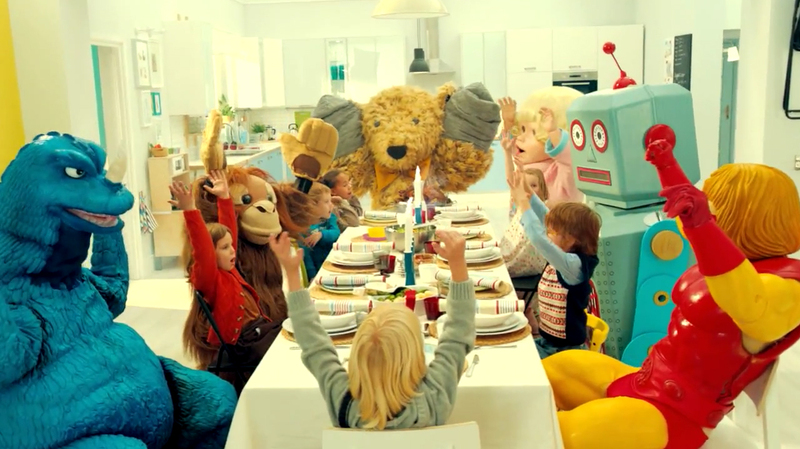 Doll, Dinosaur, Action Figure, Monkey, Robot and Teddy Bear appear in a colourful trip around Ikea’s children’s kitchen, showing what hosting a dinner party looks like when the kids are in charge. The campaign includes a music video, television commercials and behind the scenes video, accompanied by UK band Masters in France. The “Playing with my friends” track is available as a single on iTunes. The Playing with my friends campaign was developed at Mother London. Filming was shot by director Dougal Wilson via Blink Productions with producer Ewen Brown, director of photography Stephen Keith Roach. Editor was Ed Cheesman at Final Cut. Post production was done at Moving Picture Company, London, by VFX producer Julie Evans, VFX supervisor Tom Harding, VFX team Alex Chernogorods, Dan Cowley, Bevis, and colourist Jean-Clement Soret. Sound was designed by Sam Ashwell at 750mph. Music, “Playing’ with my Friends”, by Robert Cray, was performed by Masters in France.